“Before today’s discussions of social business, transparency, the humanization of work, and the democratization of the workplace with ideas such as Holacracy, there was the concept of Wirearchy. “Jon has greater insight into the structural impact online networks will have on our organisations than anyone else I know. His deep grounding in the existing systems, combined with his passion for their emerging alternatives, make him a powerful force for change. “Jon, you have more fans for your oh-so-essential work on wirearchy. My current client has put me in front of some team managers who I introduced to the concept, who are so excited by the revolution it could bring to how they co-work and co-create across the South-East region. “I don’t know anyone who has thought about the changes happening to organisations in the 21st Century more deeply than Jon Husband. He was way ahead of the game in his thinking on wirearchy — and he combines this with a deep understanding of all the management systems that preceded it. “Jon Husband lives what he studies — the shift in working relationships from large hierarchies to dynamic networks. He calls these networks wirearchies and he has been observing, and sometimes shaping, their emergence for more than 20 years. “As usage of the web spread, we had no shortage of pundits claiming everything was being overturned by it. Jon Husband, with his fifteen years of developing his nuanced view of Wirearchy, is a breath of fresh air. While seeing, far in advance of social networks and mashups, how the services of the web would make it possible for self-organising, peer-led teams would emerge, Husband also saw the critical continuing role of improved traditional hierarchies to mobilise resources, transcend boundaries, handle risk, and organise work that is actually better done in a structured manner. 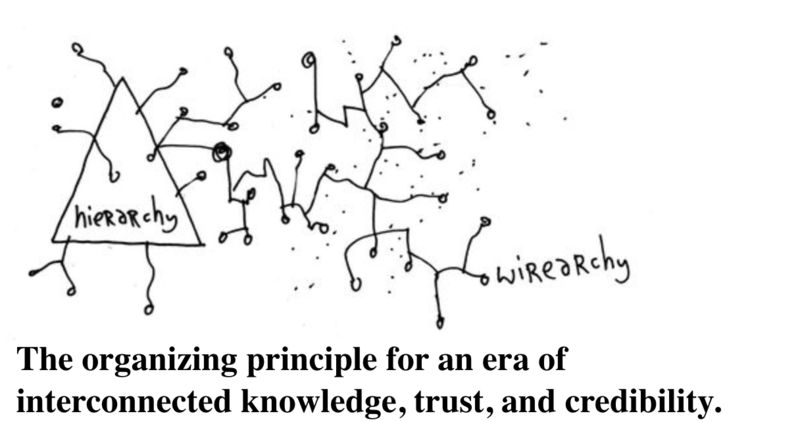 From startups to well-established enterprises wrestling with this challenge of balance and appropriate structure, to helping cities and cultures to grow into the challenging and turbulent twenty-first century, Jon Husband’s Wirearchy and related insights are essential”.